Radio Jackie News: Missing teen with links to Woking, Staines and Hounslow. Missing teen with links to Woking, Staines and Hounslow. Police are searching for a teenager who has gone missing and who has links with Woking, Staines and Hounslow. 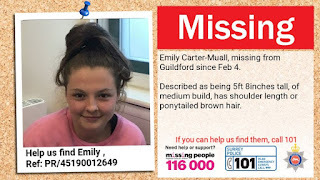 Emily Carter-Muall is fifteen and disappeared on February the 4th. She’s described as five foot eight with a medium build and brown hair which she wears in a ponytail.